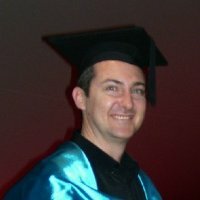 My PhD project is in medical image analysis of cone-beam computed tomography (CT). These 3D images have a low contrast-to-noise ratio, so prior information needs to be considered in order to accurately interpret the voxel intensity values and identify the regions of interest. I have used a hidden Markov random field (Potts model) to represent the spatial homogeneity between the labels of neighbouring voxels. Informative priors are derived from a previous image of the same subject, as well as from published studies. By highlighting changes in these images, I aim to assist radiotherapists in their decision making, thereby improving the accuracy of image-guided radiotherapy and reducing the incidence and severity of side-effects experienced by cancer patients receiving the treatment. This project is a collaboration between QUT and the Radiation Oncology Mater Centre, QHealth. Prior to commencing my PhD, I was involved in the Visible Cell project at the Institute for Molecular Bioscience. I’ve also worked in R&D for various international companies: writing software for editing a 3D wireframe mesh of a human face; a multimedia search engine and a cable TV programme guide using speech recognition; and an electronic medical records database based on the ANSI HL7 standard. My masters project investigated Gaussian mixture distributions of exhaled particles. In my spare time I enjoy roleplaying games and playing capoeira.